We are going to start in the region one can loosely think of as the shoulder and upper chest. A combination of bones and muscles here make up what is called the pectoral girdle. A girdle was similar to a belt that was worn chiefly by women of the middle ages to help support their mid-sections and help make them look slender. Similarly, the pectoral girdle attaches the upper extremity to the body and helps support it in its varied movements. Pectoral is derived from Latin pectus, meaning breast or chest. As one might infer from the name the pectoral girdle encompasses the upper chest. Lets dive right in, first we are going to look at the bone structure. Focus on the scapula. The scapula sits posterior to, or behind, the ribs. In Latin the ribs are called costae; almost all the anatomical names relating to the ribs involve cost-, for example the joint between the ribs and the clavicle bone is called the costoclavicular joint, which makes sense because the name tells you what it joins. But I digress, back to the scapula...think of the scapula as the major base of the shoulder and all the movements going on up there. 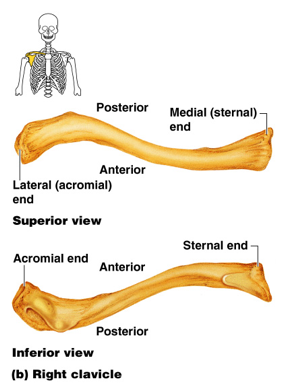 It is the chief attachment of the upper extremity with the body, joining the humerus, the big upper arm bone, with the clavicle, which in turn connects to the sternum, as mentioned above. It sits against the rib cage and slide all over, forward and back, up and down, allowing the shoulder to move freely. Now it starts to get hard as we move into all the many parts of the bone to learn, the muscles, the borders, and all the attachments locations and movements. 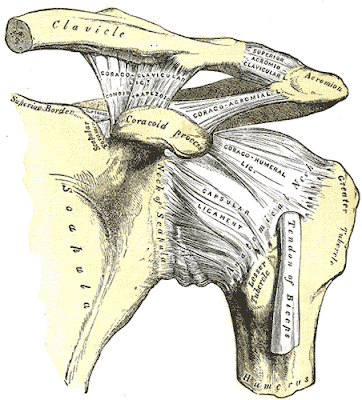 This picture shows an anterior view of the left scapula. The scapula is a triangular shaped bone that is very mobile. If a person was attached we would be face to face with them and this picture would be on our right, but since we always name left and right from the patients prospective, it is the left scapula. The superior border is toward the head, note the two bumps of bone sticking out of the top left (most superior lateral aspect), the lateral border is what you can feel if you grab under your arm pit, the inferior angle points toward the toes, and the medial border sits near, and posterior to, the spine. Borders are an extremely important concept in anatomy as many of the muscles which you will later learn attach at these points. To continue our orientation and bone landmarks, look at the area labeled subscapular fossa. Sub means beneath in Latin and will be a common prefix and fossa is Latin for a hollow depression or pit and will also be a common term. This is a concave area, shaped like a cupped hand, if it was flat on a table and we poured water into it, it would fill like a bowl. Similarly in the body the subscapular fossa is filled by a large muscle, called the subscapularis (makes sense right?). Muscles will be individually covered later but if you can start to establish connections it will help. The glenoid fossa, glene is Greek for socket, is where the head of the humerus bone, upper arm bone, attaches to, or articulates as we say in anatomy, with the shoulder. To continue integrating our anatomy terms, one could say that the proximal end of the humerus articulates with the glenoid fossa. It functions as a ball and socket joint which makes sense, if it was a hinge one couldn't rotate the shoulder all the way around with such freedom of movement (think of swimming or throwing a baseball). Understand that many connections exist, but if we break them down and attack it piece by piece, it really is a logical puzzle that becomes manageable. Note the things I describe already and try to correlate them with this picture, ie how the acromion connects with the clavicle. We are now looking at the back, or posterior, view of the right scapula. To orient ourselves, note the medial border, think of the spine sitting near it, and the lateral border being the side of the body. The coracoid and acromion processes sit superiorly. Note the large ridge of bone going across, the spine of the scapula, it is like a large wall that divides the posterior part into two regions, a superior region above called the supraspinous fossa (depression above the spine), and an inferior region below called the infraspinous fossa (depression below the spine). An important muscle sits in each fossa, the supraspinatous sits in the supraspinous fossa (nice for them to name it the same thing huh?) and the infraspinatous muscle lies in the infraspinous fossa (more on these later). 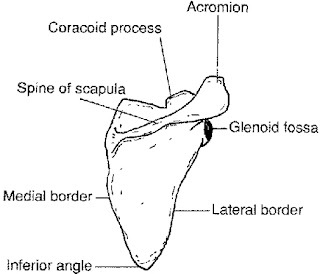 The acromion process is the just the continuation and tip of the spine, projecting laterally and somewhat anteriorly to lie over the glenoid fossa. Remember that the anterior view is concave so the posterior view is some what convex (like an upside-down bowl). On to the next one; the clavicle bone. 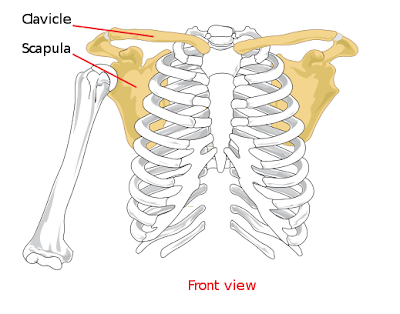 The clavicle is an S shaped bone that is quite small and fragile. It is easily palpable is most people, meaning you can feel it on the skin, and can be seen as a bulge on some. It connects the sternum (essentially the ribcage) and the scapula. Clavicula in Latin means little key, because during a certain motion with the shoulder called abduction, it turns like a key. Medially it articulates with the manubrium of the sternum, labeled sternal end above, (don't worry about what the manubrium is yet) at the sternoclavicular joint (once again the name makes sense). The sternoclavicular joint is unique, the clavicle wants to try to move anteriorly and posteriorly, so the body must restrict that movement. As such the sternoclavicular joint is characterized by thick ligments, anteriorly and posteriorly, to prevent that movement. These ligaments are very strong and it is far more common for the bone itself to fracture before dislocating from these ligaments. (For more on the sternoclavicular joint see the next post). See the fractured clavicle? It commonly breaks about two thirds of the way down, proximal to distal. The proximal end usually goes up while the lateral/distal side usually tilts down because the weight of the arm is weighing it down. In order for it to properly heal it is necessary to immobilize the arm in a sling for a number of weeks, taking the weight off and allowing it to heal. Can you now see why we call it the pectoral, or shoulder, girdle? The scapula and clavicle act to stabilize and support the arm and upper chest. Now that we have a foundation of the bones, next we will discuss the many ligaments holding them together. 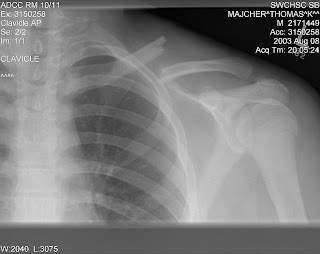 Just so you know... That picture of the clavicle fracture, was of me several years ago. What happened was I was hit by a car, flew across the street, and landed on that shoulder. I was 15 at the time I believe, and the doctors mentioned that "Too bad you're not 16, otherwise we'd enter you into a study in order to determine whether a surgical fix would allow for faster healing times." Too bad for me though. They sent me home with oxycodone and a sling. They said "If you want, you can buy a figure 8, bit it won't help much."